35. The Society has just celebrated an important anniversary. How would you summarize these forty years? An inspiring history… with many tears in the midst of great joys. One of the greatest joys is the joy of realizing the extent to which Our Lord allows us to be associated with several of the beatitudes that He preached in the Sermon on the Mount, like the one about being able to suffer for the sake of His Name. And through all the vicissitudes of the present crisis, we see that this work continues to grow, which, humanly speaking, is almost impossible. This is certainly the mark of God on the work of Archbishop Lefebvre. 36. 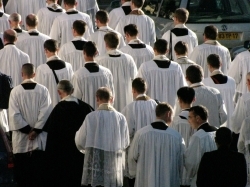 Has there been an increase in vocations? If so, what are the reasons for it? I think that there is great stability. I would like to see more vocations. I think that we will have to restart the crusades for vocations. The world as such is very hostile to the fostering of vocations; that is why we have to try to recreate everywhere climates in which vocations can once again develop. Because there are many vocations, but often they do not get to mature because of this materialistic world. 37. You commented recently, at the Conference in Rome sponsored by Le Courrier de Rome, on a meeting of around thirty diocesan priests in Italy that you attended. What do those priests expect today from the Society of St. Pius X? These priests ask us above all for doctrine, which is an excellent sign. If they are with us, it is of course because they want the old Mass, but after discovering the old Mass, they want something else. They want something more, because they discover a whole world that they know is authentic. They have no doubt that it is the true religion. Then they need to brush up on their theological studies. And they are not mistaken: they go directly to St. Thomas Aquinas. 38. This movement of priests who are turning to the Society, is it, in varying degrees, the same in all countries? There are certainly varying degrees, and even different numbers depending on the country. But we see the same phenomenon almost everywhere: The priest, generally a young one, who approaches the Traditional Mass, who discovers with great enthusiasm this treasure, little by little travels a path toward Tradition, which finally makes him completely traditional. 39. Do you have hope that this sort of interest could affect some bishops, to the point where you foresee a future collaboration? We already have contacts with some bishops, but for the moment everything is frozen by the bishops’ conferences, by the pressures all around, but there is no doubt whatsoever that in the future it will be possible for there to be forms of collaboration with some bishops. 40. Are you ready to attempt the experiment of Tradition with a bishop at the level of a diocese? The time for that is not yet ripe; we are not there yet, but I think that it will happen. It will be difficult; we will have to look closely at how we can manage to achieve that. It will be absolutely necessary that this be done with bishops who have really understood the crisis and who really want to work with us. 41. 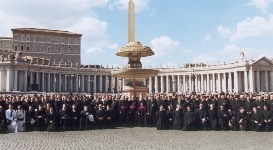 The lay faithful [affiliated with the SSPX] are increasingly numerous. There are more and more chapels. The state of necessity is still present. Do you foresee the consecration of other auxiliary bishops for the Society? Do you think that Rome could be in favor of episcopal consecrations in Tradition today? 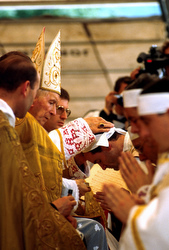 For me, the answer is very simple: there will either be bishops or else there will not, depending on whether or not the circumstances that prevailed at the first consecration [in 1988] are present again.